In response to the popularization of the daguerreotype in the mid 1800s, Paul Delaroche famously declared: “from today, painting is dead!” For the past few centuries, paintings had been coming closer and closer to reality, and suddenly here was a new medium—photography—that seemed to render all of those efforts pointless. Enter Manet and the impressionists, who stopped trying to precisely mimic reality and instead tried to capture the surreal quality of light and the emotion of a landscape. Of course, painting was far from dead. Painters just had to discover what set them apart from other art forms, and they had to capitalize on these differences. 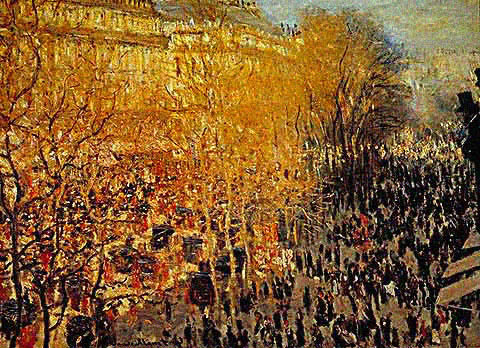 The work of Manet, Monet, Van Gogh or Matisse could never have been made with a camera. Similarly, when photography was invented it struggled to be perceived as art. Pictorialists like Demachy and Davidson tried to mimic the efforts of the impressionists in their photographs. They used techniques like gum bichromate to blur the details of a photo to make it look more like a painting. The Pictorialists were trying to get photography recognized as an art form by showing how it could be like a medium that already attained artistic recognition. 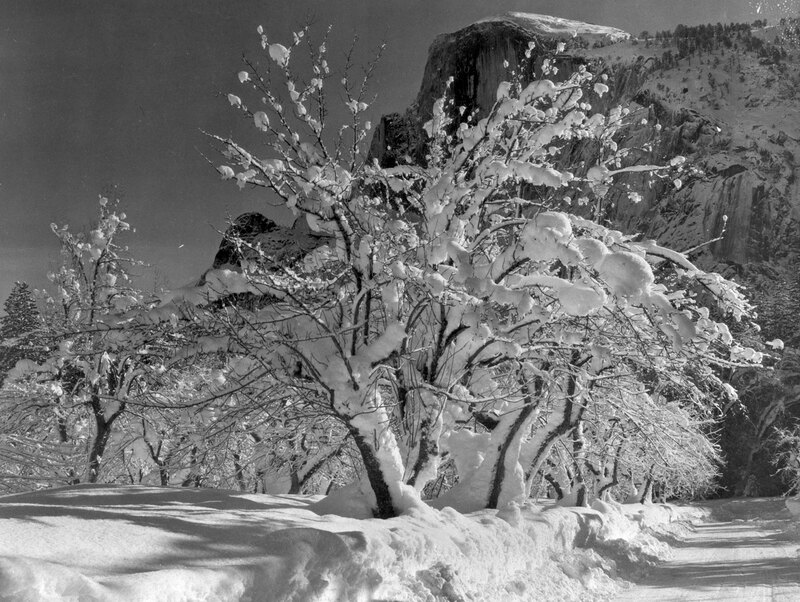 Along came Ansel Adams and friends, who founded Group f/64. In their manifesto, they stated that they were “striving to define photography as an art form…through purely photographic methods.” They defined pure photography as “possessing no qualities…derivative of any other art form.” Instead of trying to make paintings with their cameras they explored the unique capacity of photography to create sharp and accurate images. Still with me? Here’s the connection to games: Mass Effect 2 is Demachy and Demon’s Souls is Ansel Adams. We all want games to be perceived as a medium capable of creating art, but we’ve been trying to get there in different ways. Demon’s Souls approaches narrative in the exact opposite way that Bioware does. In Mass Effect 2, the story is told through conversations and journal logs. The voice acting is stellar. The writing is great. The camera sweeps in cinematic motion and all of the visuals are coated in film grain. Mass Effect 2 tries to hoist itself onto the pedestal of another medium (and it isn’t alone). It is certainly a great experience, and it’s tons of fun to play, but it doesn’t embrace its identity as a game in the way that Demon’s Souls does. Demon’s Souls demonstrates the unique storytelling capacity of games better than any other game I can think of. It plays to the strengths of its medium; it isn’t trying to be a book and it isn’t trying to be a movie. In Demon’s Souls you discover each place’s history without any help from a datalog. There is a constant sense of mystery as you explore the rich corridors and caverns. You are always pressing further into the fog, unsure of what one-hit-killer is waiting just beyond your range of vision. Your clanking armor echoes on the cave walls and you are surrounded by groans and heavy breathing. The space around you is crowded with shuffling life, but you still feel so lonely huddled in the womb-like dark. 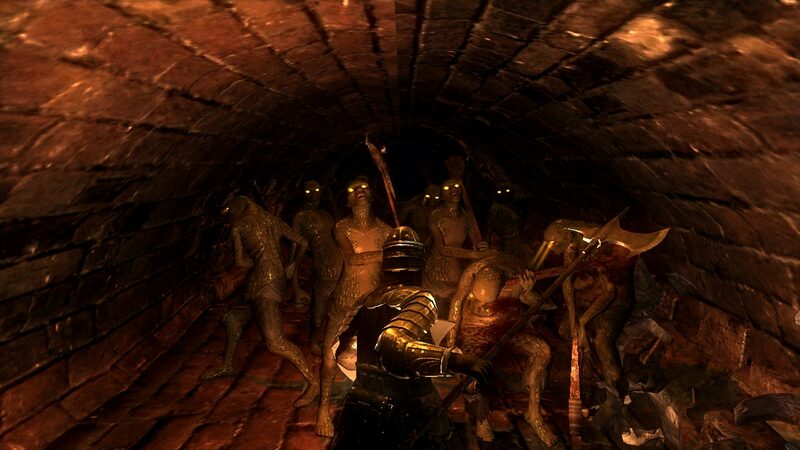 Demon’s Souls forces you to absorb its environment. You trudge through the same spaces over and over again and become intimately familiar with each tunnel and vista. The game doesn’t give you a map, but after playing it I could draw one. In a game like Oblivion or Assassin’s Creed, space is repetitive and disposable. In Demon’s Souls no space is wasted. The world is big and it’s filled with variety. You will visit every corner of it. Everyone agrees: Demon’s Souls is difficult. This is offset by the best melee combat mechanics that I’ve ever experienced. The blocking and dodging are intuitive. You can hear the thwack of flesh when you chop into an enemy with a sword. The controls are so right that mastering them is a wonderful experience. The precise manipulation of my digital body gives me a very physical sense of the game. Each on-screen movement is a natural extension of my thought. After I kill the first boss in the Boletarian Palace, I am once again in human-form, complete with shiny body and robust health bar. I wander into the wind-whipped Shrine of Storms. Imagine my chagrin when a dual-katana-wielding skeleton rolls over to me and dispatches me in a single hit. “Damn you, rolling skeleton!” I shout at the screen. I come back for more. He kills me again. And again. I slowly learn the pattern of his attacks: roll, roll, slash, pause, roll, slash. I hold my shield up to him in a challenge. I sway and I dodge and then—BAM!—I get him from behind. Several blows later he lies in a pile of bones at my feet. But the next rolling skeleton has an archer friend who thwarts my masterful tactics by staggering me at just the wrong time, and I’m dead again. Fast-forward to a few hours later when I’ve been killed a long ways into the level. I dodge and hack my way through what used to be grueling battles with ease. It isn’t because I have a bigger health bar or a more powerful sword. The game has taught me how to fight, and that is why I love it. In order to be widely recognized as a means for artistic expression, games need to explore the unique qualities of their gaminess, just like Manet did with paint and Adams did with a camera. 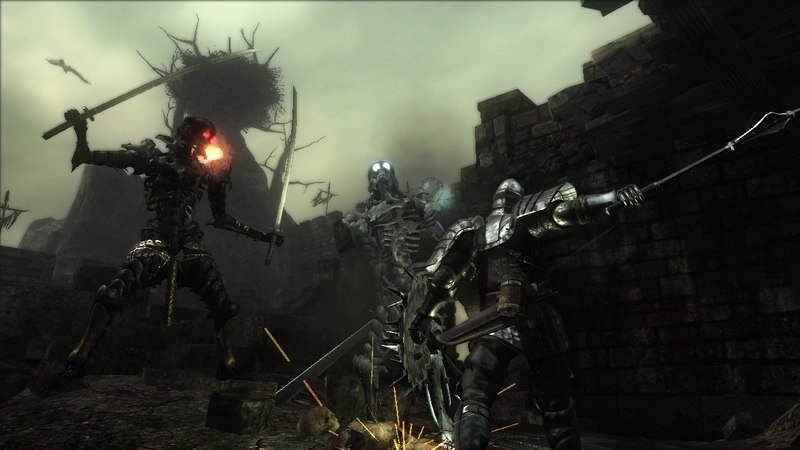 Demon’s Souls tells a story through the way that the player inhabits the gamespace. The combat isn’t just a way of getting you to the next cutscene. This is what ‘gamic’ means. You don’t have to learn excruciatingly difficult fighting techniques in order to read a book or watch a movie. I’m thirty hours in and Demon’s Souls has told me an amazing and visceral story in a way that a movie or book could not have done. Surely this is art. This certainly won’t be the last thing I write about Demon’s Souls. I haven’t even mentioned the unique multiplayer component of the game, and there are so many more stories to tell. I’m also planning on putting my fancy HD PVR to use and recording some nice videos for you to watch! In the meantime, why not check out my two favorite articles on Demon’s Souls, by Michael Abbott on GameSetWatch and Tom Bissell on Crispy Gamer. I find this article really fascinating — I didn’t know that about the history of painting and photography. I thought it was exceedingly strange that Mass Effect (have not played Mass Effect 2) had the film-grain filter. I really just did not understand it — I didn’t see what it added to the game, and I still don’t quite understand it. If it’s supposed to make the game more artistic, I just don’t get how. What an all ’round well thought out blog post. My grandpa has done alot of recsareh and learning about his camera and photography and has told me about an article saying something to the effect of maybe learning too much about the mechanical side of things can lead to over thinking which may not lead to better photographs. We’ll have to ask him about the specific article so you can read it.